Interview with the President of the Romanian Meteorological Society, Dr. Ion Sandu. Dr. Ion Sandu was elected as President of the Romanian Meteorological Society in December 2016. 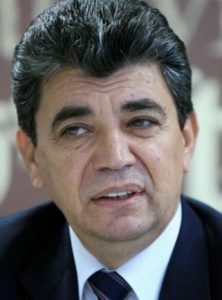 Prior to that, he was General Director of the National Meteorological Administration of Romania for more than 15 years. He is currently a full member of the Academy of Agricultural and Forestry Sciences of Romania. EMS LC: If you were to describe your society in one sentence, what would you say? 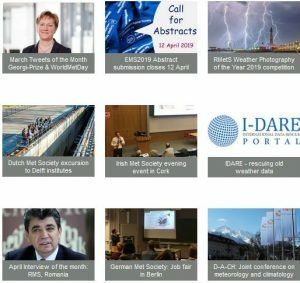 RMS brings together professionals working in the field of meteorology and experts from other fields, who play an important role in disseminating scientific knowledge to the general public and providing expert input to research studies and projects. EMS LC: When was RMS founded? RMS was founded in 1990 by a group of renowned meteorologists, who aim to explain the importance of their field to the general public . EMS LC: What are the objectives of RMS? During my more than 15-year spell as General Director of NMA, I noticed the importance of the role of a National Meteorological Service in ensuring the protection of life and the environment in the context of changes in the frequency and intensity of high impact weather due to climate change. That is why the current objective of RMS is to help NMA promote meteorology among the general public and to explain the need to take appropriate protection measures to decision makers, so as to limit the impacts of extreme meteorological events. By helping NMA we can contribute to helping decision makers to understand the importance of the role of the National Meteorological Service and the need to ensure proper financing of meteorological activities in Romania. It has been noticed many times that when economic damage is caused by floods, storms or droughts, people or institutions involved in the management of such situations tend to put the blame on the meteorological forecasts and warnings. That is why RMS promotes high professional standards and participates in public debates concerning meteorology and the accuracy of the forecasts and warnings issued by the National Meteorological Service. RMS also supports the proposals by NMA aiming to ensure necessary financing is made available to modernise meteorological activity at a national level. EMS LC: Could you explain the structure of your membership? The majority of RMS members are meteorological specialists who have an educational background in Physics, Mathematics or Geography. However, RMS also has members who are employed in areas other than meteorology, for example professors who train young students to develop their teaching skills. EMS LC: Where do you see the greatest challenges? In Romania there are faculties that train students in the field of meteorology. Unfortunately, the teachers working in these faculties do not discuss meteorology with experts in order to mutually agree on lecture topics relevant for employment in the field of meteorology. For instance, students graduating from the mentioned faculties who take up employment in NMA have no prior training in the interpretation of satellite or radar imagery. That is why a main challenge of RMS is to initiate talks with the boards of the concerned faculties to dicuss the inclusion of topics relevant to present-day meteorology in their lecture courses. EMS LC: Which activities are you planning for the coming months? RMS plans to hold a debate at the end of March 2019 in the Academy of Agricultural and Forestry Sciences of Romania. The debate will concern the possible effects of the extreme drought between August and October 2018 on the agricultural yield of the autumn crops. EMS LC: Are you collaborating with other EMS Members? I think that relationships with EMS members, especially those from neighbouring countries, must be developed in the years to come, in order to get involved in common projects such as are those connected to the Danube Strategy. EMS LC: What do you expect from the EMS? In what ways can it help you to develop your activities? The EMS Annual Meeting is especially important for young researchers. We will attempt to help as many meteorologists as possible to participate in the conference organised by EMS. EMS LC: What have been your most successful events in the last three years? The most important event in the past three years is that RMS has become a member of the National Coalition for Romania’s Modernization. This Coalition is an informal body aimed at helping civil society and public institutions. It is made up of more than 50 non-government organisations, labour unions, management associations, representatives of local public administration, academia and businesses. EMS LC: What changes do you believe your society needs to make? Because salaries are low in comparison with other employment sectors, there is a tendency for trained meteorological specialists to take up positions in other fields.. We will attempt to attract as many young meteorologists as possible to projects that will bring them additional income. By doing this we will try to stop their migration from their field that they have chosen out of passion. EMS LC: Thank you very much for the interview!